The Eye of Sauron sees all. As a fan of Tolkien's works from the books (The Hobbit, The Lord of the Rings), the histories and lore (The Silmarillion and the The Book of Lost Tales) to the movies (ALL of them extended of course), the video games and the toys and miniatures, my craving for all things Middle Earth has left me with an aching, restless nights reminiscing over my precious and Tolkien in my sleep...(teehee). As such, my fairly recent foray into board gaming eventually led me to the shores of the Havens, the hills of the Shire and the mountains of Mirkwood as I discovered the joy that is Lord of The Rings The Card Game. As far as board-gaming dynamics go, I enjoy me a good deck builder but it takes a lot of pull to get me fully committed to a constructive LCG. That's 'Living Card Game' for those not in the know and essentially what makes this form of card-gaming more superior over the more traditional 'Collectible Card Game' (or CCG) is that it does away with the blind-buy purchase model. LCGs have core sets and deluxe expansions and regular expansions all with fixed cards in each. So everyone owning a copy of a game and its expansions share the same card pool. No more randomness, you get exactly what you paid for. Now when it comes to LCGs, nobody does it better than the maestros who defined this genre of gaming. Yep, they own the trademark. I'm talking about Fantasy Flight Games. With my pennies already invested in Netrunner: another FFG LCG, albeit of a more dystopian cyberpunk nature (blog post to follow soonest), and with other titles including Warhammer 40000 Conquest, Game of Thrones and (fresh from Gencon 2016), Arkham Horror, the Fantasy Flight LCG industry is in err, full flight. No pun intended this time. Lord of the Rings The Card Game has been around for about five years now and I admit to being a bit late into the whole mythos of the game but then again, I am a Wizard. And we all know that a Wizard is never late. He arrives precisely when he means to. Lord of the Rings The Card Game is a co-operative game (the first of its kind) set in the context-rich world of J.R.R Tolkien. In terms of Middle Earth history, the time frame is set between the Hobbit and The Fellowship of the Ring and all subsequent expansions fall within this period. Except for Saga Expansions. But we'll get to those in a wee minute. Cards. Lots of cards. Over 200 cards in fact. A very detailed rule book and tokens. And two cardboard 'Eye of Sauron' threat dials. As this is Fantasy Flight, the card quality and artwork is top notch and captures the look and feel of Tolkien's Middle Earth perfectly. Just from first inspection, there appears to be two distinctly different decks of cards: Cards which form part of your hero decks and (nasty, filthy) encounter cards. As far as components go, that's it. The core set is designed only for 1-2 players but with a second core you could get up to 4 players. As this is a co-operative game, you and your fellowship will be playing against a game AI to overcome a set of obstacles and complete a particular quest. There are 3 quests in the core (easily distinguishable by the card orientation and layout) and their difficulty range increases as you progress through. But be warned. One does not simply walk into a quest. There are fell beasts and hordes of orcs, spiders and goblins to overcome. These 'enemies' form part of what is known as an 'Encounter Deck' which spells all sorts of trouble for you and your party. However, do not burden your hearts too heavily noble warriors because luckily you have a host of heroes and allies to aid you through your journeys. The core comes with 4 pre-constructed decks tailored to a particular gaming 'sphere'. These spheres are Leadership, Lore, Tactics and Spirit and each has its own very unique style of play. Leadership for example, is known for being a good all round sphere with excellent resource generation (resources being the in-game 'currency'). Tactics is the more offensive sphere focusing on attack and combat. Each of these decks have a particular set of heroes attached - from known heroes such as Aragorn, Legolas and Gimli to a few newer faces such as 'Bereavor'. You start the game by selecting up to three heroes for your party and construct a deck of 50 cards with which to play. You may only play cards belonging to a particular heroes sphere of influence (unless otherwise stated) so the general rule of thumb is having two spheres in your party and then constructing your deck based on this. Tri-sphere decks are definitely possible but will most likely require a bigger card pool (more expansions). The same applies to mono-sphere decks although these are growing in popularity given the latest card meta. Once you have your deck constructed and your three heroes selected, you set up the encounter deck as outlined in the rule book or particular quest you are playing. Quests are numbered (1 - 3) and are played in sequence. You need to complete a quest before your threat level reaches 50 (hence the turning dials). Should your threat level reach 50...Sauron sees you and well...you die, painfully. Gameplay consists of a sequence of phases with the first player going first in each progressive phase. The phases are: Resource, Planning, Questing, Travel, Encounter, Combat and Refresh. While understanding the nuances of each phase may seem a bit daunting at first, the rules and gameplay are actually very streamlined. You (as the first player) shuffle your deck and draw a hand of 6 cards. Then the resource phase: you draw an extra card and add one resource token to each hero's resource pool. Resources are used to pay for playing cards, enlisting allies and adding attachments, all of which are done in the Planning Phase. Adding an Axe to Gimli? Or playing a Forest Snare on that nasty troll that hopped out of the encounter deck? The Planning Phase is where decisions are met on which card to play and when.Next is your Questing Phase where you exhaust and commit heroes to a quest in order to progress through and on to the next quest. Now, I'm not going to bog down too much on the terminology and the rules but Questing is an important aspect of the game and fits in with the theme once you have played through a few campaigns or scenarios. Then there's the Travel Phase. Who doesn't mind a bit of site-seeing around Middle Earth? Except when these sites are nasty bogs and marshes and try to hinder your quest progress! Complete the progress on each part of a quest or meet the quest's objectives before your threat level reaches 50 and you have completed and won that particular scenario. If not, well, you die. And dying in this game is a fairly common occurrence as each scenario and quest varies in difficulty. 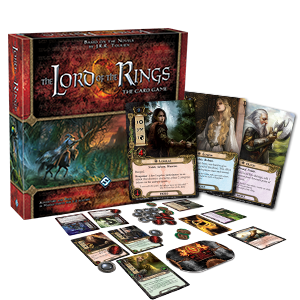 Like many other FFG LCGs, the LOTR LCG expansions are released in 'cycles' with each cycle tied to a particular story or part of the main narrative. These expansions come in three flavors: Deluxe Expansions, Adventure Packs and Saga Expansions. Deluxe Expansions (DEs) are stand-alone sets which require only the Core to be played and come with a troll-horde of quests, heroes and cards . The 60 card Adventure Packs (APs) contain (mostly) one quest and one hero and are an addition to a DE and build on the story outlined. DEs and APs form part of a 'cycle' and builds on the bigger LOTR lore - For example, the 'Dwarrowdelf Cycle' includes the 'Khazad Dhum' DE which sees your company questing through Moria and eventually coming face to face with the dreaded Balrog in the Shadow and Flame AP. APs cannot be played without their relevant DE and while this may seem a bit harsh in terms of purchase costs, you do get your money's worth of gameplay. Saga expansions build on the actual Hobbit and Lord of the Rings storylines and require only the core set to play. For an excellent resource on buying guides as well as useful reviews and deck-building options, check out The Tales From The Cards Blog. For new players, the Hall of Beorn is an excellent resource and that search engine is worthy of a Wizard's hat. Lord of the Rings is an amazing game. It's immersive,thematic and continually growing. It plays well solo (and two-handed solo), is an excellent deck construction game, great artwork and the storylines and themes for quests are well structured into each scenario.That said, the game can be brutally hard. Do not buy this game if you're not up to a challenge or would prefer not to over-analyze or think too hard about your deck building. You will die in your play through, several times in fact. But the rewards of overcoming the obstacles in each quest is satisfyingly good. You WILL want to progress through the next quest, tweaking your deck ever so slightly or switching spheres or trying combos or crafting custom hero-centric decks for the one deck to rule them all. So, if you're up for an LCG that delivers in theme and is co-op, challenging yet fun then perhaps its time for an adventure through Middle Earth. But be warned: It's a dangerous business, going out your door. You step onto the road, and if you don't keep your feet, there's no telling where you might be swept off to.